Honda Unicorn has already carved a niche for itself in the Indian bike market. The bike is a perfect combination of powerful performance, advanced safety features and excellent looks. Honda Unicorn happens to be the first bike in India with mono suspension feature. The bike has all the features and facilities which one could wish for. Honda Unicorn is available in the following colors – Red with Black graphics, Black with Red graphics, Space Silver Metallic and Pearl Igneous Black. The sleek headlamp flasher, aerodynamic body lining, eye catching tail lamp, beautiful body graphics give a stylish look to the bike. The alloy wheels give a sturdy appearance. Honda Unicorn gives extra comfort features to the rider. The self start bike has Analogue Fuel Gauge, Analogue Tacho Meter, Analogue -1 Trip Meter, Analogue Speedometer and Passenger Footrest. Other comfort features include Pass Light and Low Fuel Indicator. The bike has flexible seating arrangement and ample foot space. 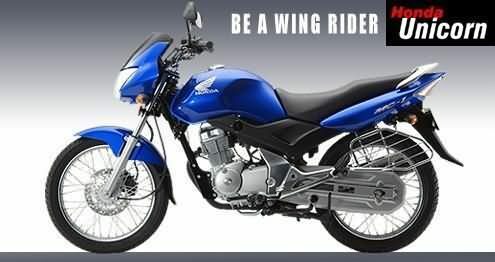 Honda has used many state – of- the art technologies like hole plugging mechanism, tuff up tube and easy primary kick which add to the comfort of the rider. Honda Unicorn has various safety features. It has (front) telescopic suspension and (rear) Advanced Technology Mono suspension. Mono suspension system prevents discomfort and gives safety while driving on bumpy roads. The bike has 240mm disc Brakes (front) and 130 mm drum (rear) brakes. Honda Unicorn has 149.1 cc, 4 stroke Air cooled OHC, single cylinder engine. It churns a maximum power of 13.3 bhp at 8000 rpm and a maximum torque of 1.3 kgm at 5500 rpm. The price of Honda Unicorn is Rs.57, 663 (taking Delhi as base price location). However, the price specified is indicative price only and reflects lowest approximate price which excludes tax, registration, insurance and cost of accessories.